Thank You to These Donors for Making the Field Possible! In reading articles from the camp newspaper, it is clear that baseball served as a glue to bring people together and provided bridges to communities outside the barbed-wire fence. After the war, many former incarcerees have continued to exclaim, "Baseball saved us!" The Minidoka baseball field project became even more exciting when it was decided that the field would be built in a single day. This is based on the 1952 Farm-In-A-Day event held on the John Herrmann property. John Herrmann, a World War II and Korean War veteran, received one of the over 180 land lots that had been distributed by the Bureau of Reclamation after the 33,000 acre Hunt Camp had been subdivided. The North Side Soil Conservation District approached Herrmann to allow his land to be a demonstration farm showcasing the newest farm equipment and conservation practices. On April 17, 1952, 1500 volunteers built a two bedroom house, constructed animal corrals and plowed fields on land that had once been Minidoka War Relocation Center. Over 11,000 spectators showed up to watch the day's events. In keeping with the spirit of the 1952 Farm-In-A-Day event, Minidoka NHS and Friends of Minidoka (FOM) are planning a Field-In-A-Day event on May 28, 2016. On that day individuals and groups are invited to join FOM and park staff in rebuilding one of the 14 baseball/softball fields that were interspersed among the 44 residential blocks. Baseball field prep will take place in the days preceding the Saturday event. The day's events will include building and installing the field structures: backstop, two scoreboards, two player benches and two bleachers; applying all field markings; installing bases; installing a wayside interpretive panel and donor plaque; and creating accessibility paths to the field. We invite the public to come help build, serve refreshments, or even just watch on Saturday, May 28, 2016. 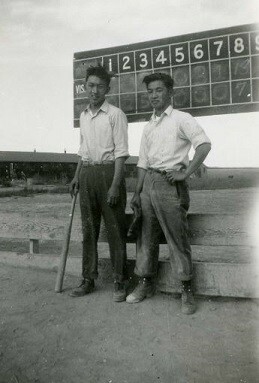 Formal dedication of the field will take place Sunday, June 26 during the annual Minidoka Pilgrimage. Donations to the Field-In-A-Day Project will be used to build the baseball field and its supporting structures: scoreboard, backstop, player benches, bleachers, wayside exhibit panels, and a donor plaque listing all of our contributors. Donations will also be used to support both the Field-In-A-Day event and the dedication. Monies collected beyond the actual reconstruction of the field will be used to maintain the field in the future. The baseball field will be open to visitors, school groups, and special events.